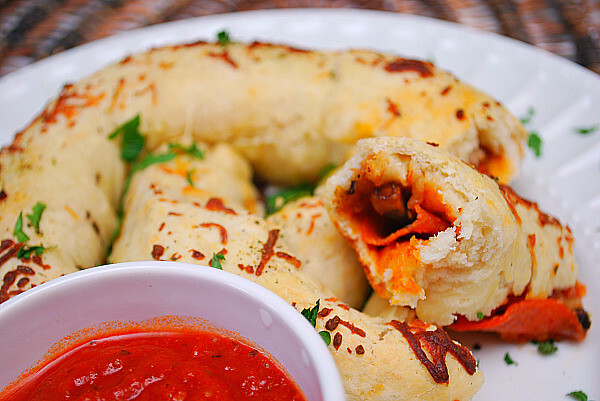 I've always been a fan of stuffed pretzels - both sweet and savory. You can fill them with whatever you'd like and the possibilities are endless! This is something I plan on making more often as a snack to keep on hand in the freezer. Combine flour, yeast, salt and sugar in the bowl of a stand mixer to mix fitted with a dough hook. Combine hot water and oil in a measuring cup. With the stand mixer is running, gradually pour in enough of the hot liquid until the mixture forms a sticky ball. The dough should be quite soft. If it seems dry, add 1 to 2 tablespoons warm water; if too sticky, add 1 to 2 tablespoons flour. Continue mixing until the dough forms a ball, then process for 1 minute to knead. Transfer the dough to a lightly oiled bowl. Coat a sheet of plastic wrap with cooking spray and place it, sprayed-side down, over the dough. Let the dough rest for 10 to 20 minutes. Cut the prepared pizza dough into 4 equal pieces and roll each out into a rectangle. Scatter the cheese, pepperoni and mushrooms over the dough. Brush the one of the long sides with a little egg wash then, starting with the opposite side, roll the dough up into a log, enclosing the toppings inside. Shape the log into a pretzel and transfer to a baking sheet. Brush the top of the pizza pretzel with olive oil and sprinkle with parmesan cheese and Italian seasoning. Bake until golden brown, about 15-20 minutes. While the pizza pretzel is baking, place a medium pot over medium-high heat to heat up marinara or pasta sauce, until warm. 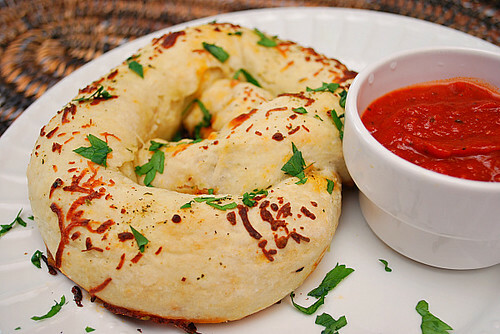 Serve the pizza pretzel with the marinara/pasta sauce dipper alongside. * To make ahead/freezer meal - Prepare the pretzels as directed above and do not bake. Instead, wrap prepared pretzels in plastic wrap and foil. Place in a freezer bag and freeze. When ready to prepare, preheat the oven to 400 degrees. 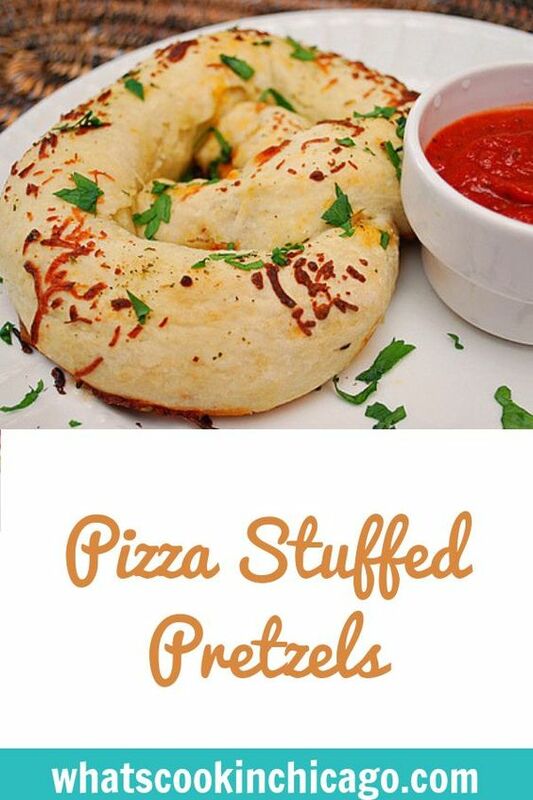 Place frozen stuffed pretzel on a baking sheet and bake in the preheated oven for 20-30 minutes. No need to defrost pretzel before baking. Those look fabulous, I'm going to have to make some up to have in the freezer! That looks great. It is a perfect snack, even for the munchkins. You WHIPPED UP pretzels?! Wow. You're amazing. They look great! What a great friend you are. YUM! Pizza and pretzels! Definitely will be trying this for lunch tomorrow. Fantastic! Mmmm... yes please! I can't wait to make these! these are my husband's two favorite foods! Great recipe! Instead of ordering pizza, I made this last Friday night and my husband LOVED it! I was too lazy to make dough so I bought pre-made fresh whole wheat dough at the grocery store for $1.50 and was able to make 2 pretzels. We didn't even use marinara sauce because it was so yummy already! Thanks! Just made these last week - they disappeared so quickly. My kids loved them - thx! I just made these! They were delicious!!! Thanks for another great recipe!! Do you leave the plastic wrap and the foil on while baking?